The first Republican attack on Obama’s nominee to the EPA reveals the party’s fundamental beef with the agency as a whole. Well, that didn’t take long: A Republican Senator has already placed a “hold” on the nomination of Gina McCarthy to head the Environmental Protection Agency. Senator Roy Blunt of Missouri announced the move Monday, and cited delays in EPA approval of the St. John’s Bayou and New Madrid Floodway Project in the southeast part of his state. This is more bluster than anything else—holds are simply a notice of intent to filibuster, and Majority Leader Harry Reid is free to ignore them. McCarthy hasn’t even had a hearing before the Environment and Public Works Committee in the Senate, much less received a committee vote, so Blunt is really jumping the gun here. But his is the opening salvo in what’s sure to be a long war. Republicans detest the EPA—remember, in the 2011 primary debates six Republican presidential candidates called for either a moratorium on all EPA regulations or an outright elimination of the agency—and Blunt’s hold is a variant on their standard attack. In right-wing mythology, the EPA is an out-of-control bureaucracy that’s either wildly incompetent or specifically designed to suffocate private enterprise in order to please radical environmental groups. 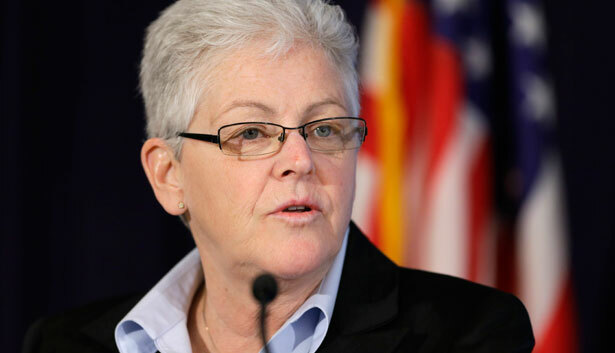 The thinness of these attacks is evident when one examines the record of Obama’s EPA. From yanking planned smog rules to repeatedly delaying greenhouse gas emission rules, the agency has been if anything too sluggish and cautious. This, of course, is the Republican game: By painting a relatively moribund federal agency as out-of-control, they help redefine the Beltway debate. Blunt’s objection here is a good case study. The St. John’s Bayou–New Madrid floodway project is so objectionable that if the EPA didn’t stop it, it would stop nothing. It’s a project that is so bad that in 2007 a federal judge not only ordered it stopped, but ordered the Army Corps of Engineers to dismantle the $7 million of work it had already done. Michaela Grunwald of Time magazine is the guru of myth-busting this particular project, having wrote about it extensively in 2000 and 2007 as an poster child for wasteful Army Corps of Engineers projects designed more to please Congressional big-shots than to actually improve infrastructure. “In the pantheon of dumb Army Corps of Engineers boondoggles, a $112 million flood-control scheme in Missouri’s southeast boot heel ranks among the dumbest,” Grunwald wrote. In short, there is a vast flood plain in this region of Missouri, where the Mississippi River stops and creates wetlands larger than the District of Columbia. The proposed project would wall off the Mississippi from this flood plain—the last surviving one if it’s kind—ostensibly to protect the downstream community of East Prairie. There are just a few problems: one, as Grunwald reported, a Corps official has admitted under oath that building a levy around East Prairie would be more effective and cost one-tenth as much. Two, there would be huge environmental consequences: the wetlands are a haven for millions of fish, birds, and other animals that would be devastated if the area was drained. Even the Army Corp’s top lobbyist, in private e-mails, called the project “an economic dud with huge environmental consequences,” and was angered he was being tasked to push for such “swine.” The reason members of the Missouri Congressional delegation are pushing so hard for it, Grunwald surmises, is that a small number of very wealthy and powerful farmers would benefit from having the land drained so they could use it for crops. The EPA should naturally strive to meet deadlines, but taking a project that even its proponents admit privately has “huge environmental consequences” and making it the poster-child for regulatory overreach is audacious, to put it generously. This almost certainly won’t be the primary cudgel the GOP uses against McCarthy, it’s more just Blunt fluffing those farmers back in Missouri—but it channels the basic GOP complaint with the EPA. They would just prefer it not exist. Read George Zornick on the Congressional Progressive Caucas’s budget proposal, which would increase spending on jobs while decreasing the public deficit.